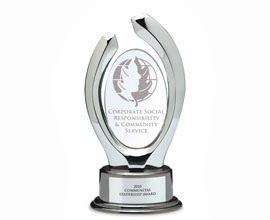 "The winners of the inaugural European Corporate Social Responsibility (CSR) Award Scheme celebrated their achievements at a special ceremony in Brussels. The 63 winners of the inaugural European Corporate Social Responsibility (CSR) Award Scheme celebrated their achievements during a special ceremony in Brussels. Responsible and sustainable business practices are increasingly important during this economic downturn. As Europeans have less confidence in business than some years ago, it is crucial that the business community makes the restoration of trust and legitimacy a priority. Renewed focus on products and services that address environmental and social needs is a viable route back to growth and job creation. This pan-European award scheme aims to inspire CSR excellence in partnerships, with particular emphasis on collaborative programmes that tackle sustainability through innovation. Successful projects represent a variety of business sectors, ranging from banking to pharmaceuticals. Launched in 2012, the national awards reward winning partnerships in two different categories, small and medium-sized enterprises and large companies in partnership with at least one non-business stakeholder. The national awards are held in advance of the European CSR Award Ceremony which showcases the winners and best practice partnerships and collaboration." Who says "game", also mean "winner" and "loser" and potentially "little frustration". In general, adults should not take care to encourage a competitive approach to the game. For the rest, Carine Chauvet advise to adopt the ruse. "To get round the issue of victory and defeat, it is good to emphasize cooperative game or to play in team. In this way, the joy of victory and the deception caused by the defeat is shared between several people. Same result with hasard games, such as « small horses ». When chance decides, defeat is easier to accept. In addition, the toy librarian denounces the false good idea that is to always let the child win. The message sended is translated as: "You are not able to win, so I'll let you win. "To think that because he is younger, he is weaker in the game is wrong. Remember how many times you have lost a game of visual memory against a child. In addition, this attitude deprives the child of a true victory, much more rewarding for him. Alexandra Latouche encourages to verbalize and to explain to the child before starting the game or activity. "Often, when starting a game or activity, the child does not understand its purpose or what is expected of him. That is why, in the case of making masks, for example, care is taken to place a finalized at the center of the table in order to identify the result of the activity mask. Finally, to reduce tensions and cry, it is important to inform the child at least 5 minutes before the time of the end of the game. To Carine Chauvet and Alexandra Latouche, there's no doubt: when you explain to the child that he will soon be time to move on, he accept better to change. Article written by Anne-Sophie Casal, trainer at FM2J, center of training for games and toys jobs, Lyon, Ludopole. 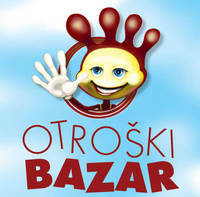 Otroški bazar (Children’s Bazaar in Slovenian) is the biggest fair event in Slovenia, launched in 2006 at the Ljubljana Exhibition and Convention centre. In 2013 it will take place two times; first in Maribor (2nd Edition) and in Ljubljana (for the 8th Edition). The Ljubljana Edition will occured from September 12 until September 15 2013. It is an educational fair. 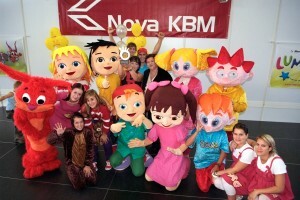 An event which brings together children and families from all over Slovenia in one single place. The first Otroški bazar in Maribor was attended by 14,000 visitors and 130 participants, while the seventh Otroški bazar in Ljubljana was attended by 36,000 visitors and 290 participants. By saying this Otroški bazar again proved itself to be the biggest family fair event in Slovenia and an event of experience. Parents have an opportunity to familiarize themselves with children’s products and services, with different ways of spending quality leisure time with their families, with extra-curricular activities for children, with children’s clothes, furniture, and new ideas for the holidays. Otroški bazar also listens to the children's needs and whishes, their creativity and playfulness, that is why it gives them many opportunity for different activities. Through enetertainment and playards strenghtens their social inclusion and belonging, it teaches them the respect for other people and the animals. It offers them a wide range of creative workshops, play nooks, a rich programme, lots of sports and other activities.